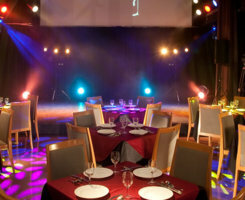 [en] Osaka's first night entertainment show! 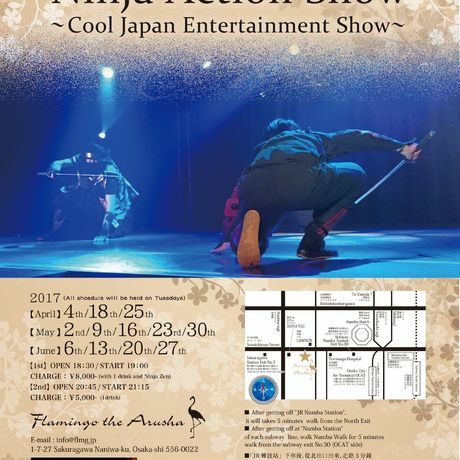 Ninja action show · Hana Kazu Donaka · Japanese musical instrument live fused, Japanese real entertainment. 2017 (All holding dates are Tuesday) 【April】 4/25 【May】 5/2, 5/9, 5/16, 5/23, 5/30 [June] 6/6, 6/13, 6/20, 6/27 【2nd】 OPEN 20: 45 / START 21: 15 CHARGE: 5,000 yen (with 1 drink) ※ Please select the schedule and make a reservation. [en] Osaka's first night entertainment show! 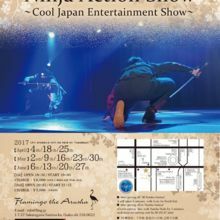 Ninja action show · Hana Kaido · Japanese musical instrument live fused, Japanese real entertainment. 2017 (All holding dates are Tuesday) 【April】 4/25 【May】 5/2, 5/9, 5/16, 5/23, 5/30 [June] 6/6, 6/13, 6/20, 6/27 【1st】 OPEN 18: 30 / START 19: 00 CHARGE: 8,000 yen (with 1 drink and ninja menu) ※ Please select the schedule and make a reservation.